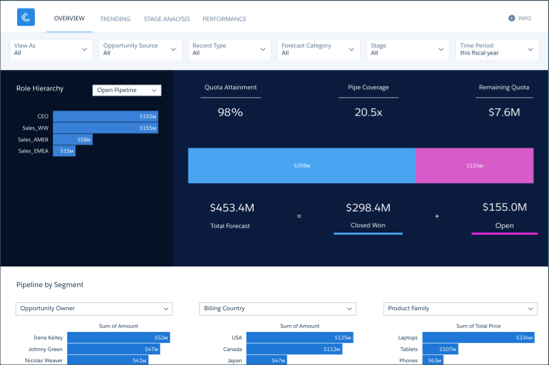 See how Analytics lets you mix Salesforce and external data. Create and add a .CSV file to the Quotas dataset to complete Sales Analytics dashboards. We show you how to put this final touch on Sales Analytics here. As the DTC Salesforce admin, you know that DTC keeps specifics about quotas (such as their amounts and the period they cover) in a tool that’s not part of Salesforce. You know exactly where, and you need to get that data into Sales Analytics so it shows in dashboards. Dashboards showing quotas, such as the Company Overview and (even worse) the Executive Overview, won’t be meaningful without showing targets for individuals and the team. Just in case you haven’t done so yet, go to the Analytics for Sales Managers app and have a look at those dashboards. In Executive Overvew, click the Sales Performance widget. You can see a place for Quota Attainment, but there’s nothing there! Let’s fix this by creating and importing a CSV file with the quota data. CSV stands for comma-separated values, a standard format used to store data. Each line corresponds to a row, columns are split with a comma, and the top line in the file contains the names of each column. See the example further down. Assemble quotas data into a plain CSV file. Import the data into a dataset called Quota. Just so you know, Sales Analytics is picky, and expects the file to follow a precise format. First, make sure it’s just a simple CSV file and NOT an .xls or other file. In fact, only open your CSV file in a UTF-8 compliant text editor, like Sublime, or Sales Analytics might choke on it. QuotaAmount -- the amount assigned to each team member. StartDate (in yyyy-mm-dd format) -- the start of the period you want your team to reach its quota. OwnerName -- the name of the team member. 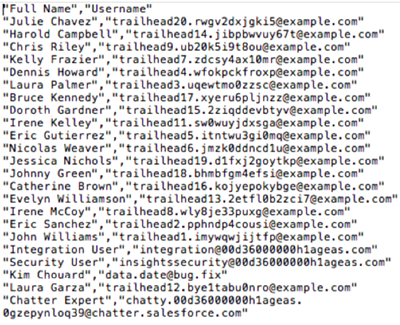 This is the user’s Full Name in Salesforce. Username -- the team member’s Salesforce User ID. Use the DTC quota tracking tool to get the other information to complete the file, that is amount and start date, and export that as a CSV file, as well. Merge the data from the two files into a single CSV, being careful to put the right dates and amounts next to the right members of your team. Clean the file up, getting rid of extraneous spaces, characters, and so on. Put the header ‘QuotaAmount,StartDate,OwnerName,Username‘ at the top of the file. Okay, while we know CSV files are tremendous fun, we don't want you to spend precious Trailhead time building your own. In the real world, set aside time for cutting and pasting. 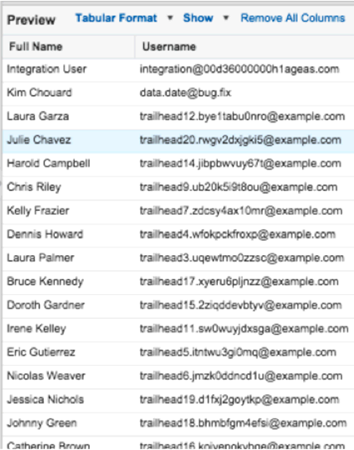 In Trailhead, we provide a prebuilt CSV file with all the right data in the right places -- you can find it in the Trailhead Data Manager. Read on to find out how to get it and what to do with it. For Trailhead only, complete the following procedure. You won’t have to do this to set up Sales Analytics in your own org. Normally, you’d gather your own quota.csv file. This step saves you that trouble. Go to Analytics Studio, then open the app picker at upper right. Select Trailhead Data Manager, then click Trailhead Data Manager link under Items. Click the Quota Data circle, and then click Download Quota CSV. Save the file, ‘DTC_Quota.csv’ in your Downloads directory. While you’re in the data manager, if you see a message that your data isn’t up to date, click Refresh Sales Data and wait for that to finish running. Now, let’s add the file to the Quota dataset in your app. In the app picker at left, select Analytics Studio. Click Analytics for Sales Managers to see the complete list of app assets. The app’s assets include dashboards, lenses, and datasets, all organized into their own sections. Be sure to click the name of the app and not Run App. In the Datasets section, click View All to the far right, and locate the Quota dataset. Click the arrow to the far right of the dataset name and click Edit. In the next window, click the Replace Data icon at upper right. That takes you to the Replace Dataset Data page. Click Select file or drag file here…. You have to run the dataflow again to make sure Sales Analytics adds your sales team quota data, which you’ve just uploaded, to all the other datasets of your app! From Analytics Studio, click the gear icon in the upper right, and select Data Manager. Below the page title, select Dataflows. Scroll to the app Analytics for Sales Managers. Open the menu on the far right opposite the app name and select Run Now. It takes a few minutes for the dataflow to run. Once the dataflow finishes running, your app dashboards include your team’s quotas so you can see how each of them is doing against their target for the period. When it’s done, take a look. What else can you learn from the dashboard? Below, under Pipeline by Segment, you can see individual opportunity owners. That lets you see quotas for individual members of the team. Click the bar for one of them and the dashboard shows you just that rep’s results against quota and the product areas they’re selling, under Product Family. For an even more granular breakdown, change the Product Family filter to Product Name. The numbers you see in your org may be different. That’s because they’re based on a period (in the image above, this quarter), and the number changes depending on how much of the period has passed. If you’re just starting your quarter, quota attainment will be low. It should grow as you move through the quarter. That’s it! Your app is all set for Laura to use. Now, the fun can really begin: Laura can use the app’s dashboards to get a fast, visual overview of the quarter and take the actions she needs to manage her team to success. Just one more step: Share the app with Laura. Go to the Analytics Studio tab. Locate the Analytics for Sales Managers app in the list of assets. Click the triangle at far right and select Share. Add Laura to the list of people who can use the app. That generates an email to Laura telling her to go ahead and start using Sales Analytics. Congratulations on a patient job, carefully done. Laura just sent you an email telling you about the lunch she’s going to take you to at your favorite seafood place next time she’s in town. Awesome. Of course, your job as Salesforce admin is never done, and there’s certainly some fine-tuning ahead. But, for now, you can pat yourself on the back for finishing the process of creating Sales Analytics! Update the Sales Analytics App Quota (Target) Dataset help.